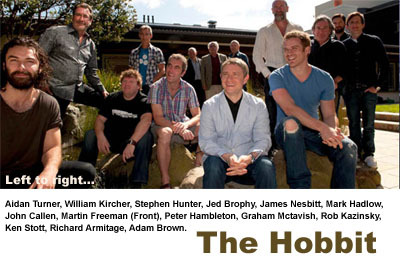 Ah, here’s the first cast shot from the new movie for The Hobbit. It includes one of my favourite actors, Martin Freeman, who will of course be playing Bilbo Baggins. Well, it should keep everyone at my publisher, HarperCollins, very happy – as they own the rights to the Tolkien books, and every time one of these movies comes out from Peter Jackson, they are left rolling ten pound notes to light their cigars (or at least, they would be, if they smoked in the office). That is to say, the book sales rise lots. Let’s hope we get some new illustrated editions to buy. Although it has to be said, my Alan Lee ones are such works of art, it would be hard to know how they could be topped. I am sure someone is working on it, though.